Do you consider yourself an adventurous person? Are you someone that likes to try new things? Do you dream of far off places, new sights, smells, tastes, and adventures? Have you been planning the trip of a lifetime but, after asking your partner, sister, best friend, cousin, and/or old high school classmate you barely speak with anymore, found that nobody can take off on a trip with you? I found myself in the same position in 2012, searching for answers but coming up confused and empty-handed. I just wanted someone to make it easy for me. I just wanted to know that I was going to be okay. I remember wanting to travel but being told I could never do it on my own. People worried I would end up like characters in the movie Taken. “It’s a dangerous world. Haven’t you seen the news?” my friends and family would say. But I was tired of people telling me what I couldn’t do – and making them doubt myself. I started out full of fears, but through traveling I learned that I’m brave, powerful, capable, and strong. So are you! 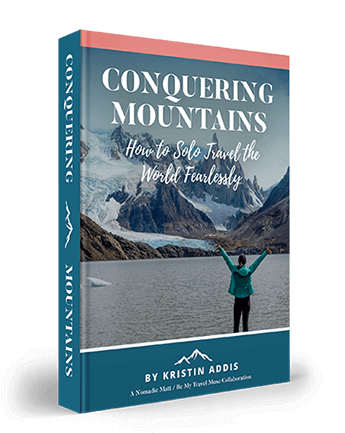 I wrote book to help you conquer your fears, save money, plan your trip, and make your travel dreams a reality. I know what it’s like to want to travel more but worry money, safety, being lonely, friends, and a career – because I’ve been there. – What About My Career? – How Much Money Do You Really Need? – Immunizations: Where, What, and How? Packing It In — What’s Really Essential? – Will Solo Travel Help You Find Yourself? Plus, a full listing of resources to use before and during your trip, and seven case studies of solo traveling women of all ages, from all kinds of different places, and from all walks of life. If you’re like me, you’re busy and don’t have the time to comb through the thousands of travel blogs that exist today. Even if you did, how would you know who to trust? Conquering Mountains: How to Solo Travel the World Fearlessly has all of my tips after three years of traveling on my own, but I didn’t stop there. I asked 15 other solo travel experts for their best tips and included the best of their suggestions in the book as well. Women and men have different needs in daily life, so there’s no question that those differences extend to traveling as well. There weren’t any guide books out there already that I felt adequately covered not only how to prep, but how to create your own adventure independently and bravely. I don’t just want you to be prepared, I want you to be exhilarated, inspired, and motivated so that nothing stands in the way of your trip of a lifetime. Even if you don’t feel brave right now, this book can help to give you the tools you need to build your confidence and get on that airplane. Every link, packing list, and all of the best solo female travel blogs are listed on here so that you can get right to the resources that work. The book is available for $14.99 in PDF form for your computer or e-reader (or printer). Once you purchase, it’s yours for life. And you’ll get free updates whenever I update the book – for life! Plus, you can always reach out to me during your trip if you have questions, concerns, or need a virtual hug.